Lydia knows first-hand that ‘having it all’ isn’t everything it’s cracked up to be. As far as she’s concerned, when it comes to job versus family, it’s a case of one or the other. And whilst most women her age have spent years climbing the corporate ladder, she’s made a career out of bagging her perfect man. Now, nearly thirty and still single, Lydia wonders if she’d made the right choice. Realising the time has come to take stock, she goes against her family’s wishes and decides to travel, in the hope of finding a new direction. At least that’s the plan. I really enjoyed this book and found Lydia a very likeable protagonist. She was unusual in wanting a family rather than a career and I could relate to her feeling that her friends and family wouldn’t understand this. It is unusual these days for women just to want to stay at home to look after a family rather than to combine this with work. Or perhaps it is just unusual for people to be able to do that that. When she came up with her ‘little white lie’ that she was a top chef researching Greek food, I just knew that this was going to come back to haunt her! And it most certainly did in a very amusing way. Poor Lydia’s harmless little lie got her deeper and deeper into a difficult situation and she could not see how she could dig herself out of it. As Autumn draws in here, it was lovely to read about the Greek island setting with its little villages, sparkling sea, dramatic hills and secluded beaches. I’ve never been to Greece but this book certainly put me in the mood to visit sometime. There was a great cast of characters in the book too from the lively Greek family Lydia was staying with, to her own rather mad but hugely supportive family and Sam, the climber she meets and keeps bumping into. It seems clear to the reader than Sam might just tick all the boxes Lydia is looking for in her Mr Right but Lydia doesn’t seem to see this. And Sam is keeping a few secrets of his own…. 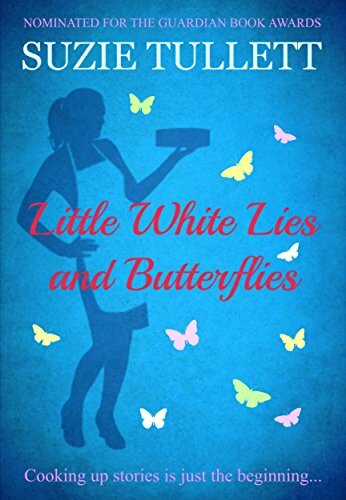 Little White Lies is a relatively short read at around 200 pages so it was a quick and fun read. It’s light-hearted and romantic with lots to make you smile. But be warned not to read when you are hungry as the descriptions of the lovely Greek food will have you drooling! Glad it’s not just me who can’t remember her own blog posts!